You may have heard of ORCID iDs but don't know what they are for or how to create one. This guide explains why you might need one, how to sign up and how ORCID identifiers are being used by organisations, publishers and funding organisations. Why do I need an ORCID iD? Who needs an ORCID Identifier? If you are involved in research and are publishing the outputs research of your research, you should register for an ORCID iD. You might also think about registering if you are a postgraduate student who may be publishing as part of your PhD research. ORCID iDs are increasingly being used by publishers, funders and other organisations to confirm identity and improve their workflows. Their use has been compulsory since 2016 for some funders and publishers. What is an ORCID Identifier? An ORCID® identifier or ORCID iD is a 16-character identifier that can be used to clearly identify you – and not another researcher by a similar name - as the author/owner of an academic output or activity. Your ORCID iD belongs to you and not to the institution that you work for or a company. You get to decide what information you associate with it, who can see this information and which other organisations can add information on your behalf. This means you can keep adding to it thoughout your research career. The idea behind ORCID identifiers is that they should be a stable link between all your research activities - grant applications, manuscript submissions, publications, entries in institutional repositories and your peer review activity. 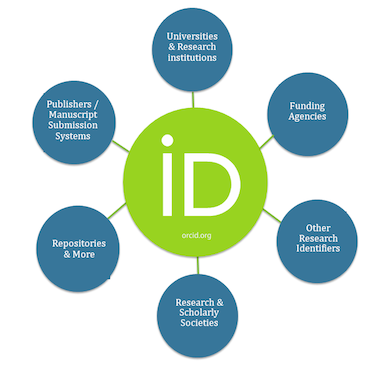 ORCID is an open, non-profit, community-driven effort to create and maintain a registry of unique researcher identifiers and a transparent method of linking research activities and outputs to these identifiers. ORCID is unique in its ability to reach across disciplines, research sectors and national boundaries. It is a hub that connects researchers and research through the embedding of ORCID identifiers in key workflows, such as research profile maintenance, manuscript submissions, grant applications, and patent applications. The ORCID organisation is funded through membership. Current members include government agencies, universities and research organisations, publishers, funding agencies, learned societies, manuscript tracking services and database providers. A full list of ORCID members and how they are working with ORCID IDs is available.